Editor's note: this interview features videos captured from the Japanese version of the game. In the UK & Ireland this game will be available in English. Thank you for coming, everyone. I would like to start by asking all of you who worked on the desert exactly what it was you did. I’m Takemura from the Entertainment Analysis & Development Division (EAD). The desert has three independent areas. I worked on the third. The desert has three whole areas? Yes. In the forest and volcano, the theme was playing the same areas multiple times, but we used a completely unique “transformation system” for the desert, so we made three separate areas. Each one turned into quite a rich stage. That is representative of how dense the content of this Legend of Zelda game is. You just used the word transformation, which you don’t usually hear used in conjunction with The Legend of Zelda. I will ask about that in more detail later. Huh? The desert becomes a sea? Yes. (laughs) When the desert becomes a sea, you use a boat for transportation. Huh? You cross a desert in a boat?! Yes. (laughs) The dungeon you eventually arrive at is a stage set on a ship drifting around a desert sea. I worked on that, too. I’m Kitagawa from EAD. I worked on the first game field and dungeon when you first enter the desert stage. I guess we did! (laughs) In the first area, we challenged ourselves to incorporate all kinds of gameplay revolving around that transformation system. You say the desert has three areas, so it’s a rich place representative of this dense Legend of Zelda game. I doubt the readers of “Iwata Asks” understand what you mean when you talk about transformation and the desert becoming a sea. Fujibayashi-san, how did you compose the desert? So far, we’ve talked about three game fields - forest, volcano, and desert - and each one has its own theme. In the forest, we tried to change the landforms for many forms of gameplay. For the volcano, rather than making big changes to the landforms, we tried to change gameplay by changing the rules. Then we wondered what to do for the desert. Well, The Legend of Zelda: Ocarina of Time1 was based around present and future, and The Legend of Zelda: Twilight Princess2 was based around light and shadow. 1The Legend of Zelda: Ocarina of Time: An action-adventure game released for the Nintendo 64 system in November 1998 in Japan. 2The Legend of Zelda: Twilight Princess: An action-adventure game released for the Wii console and Nintendo GameCube system in December 2006. The gameplay involved clear contrasts. The original game, The Legend of Zelda3, had first and second quests. 3The Legend of Zelda: An action-adventure game released for the Family Computer Disk System in February 1986 in Japan. In Europe it was released for the Nintendo Entertainment System in November 1987. That’s right. We wanted to make gameplay with that kind of contrast for the desert. In Ocarina of Time, you went back and forth between the present and a few years later, but you had to go to the Temple of Time. Very early on, we began researching and experimenting with making use of the Wii console’s capabilities so players could go back and forth between the past and future in an instant, wherever and whenever they wanted. Like an experiment in which you shoot an arrow into an empty desert, and when it hits something, that desert area suddenly changes in real time to a verdant land. We wondered if we could turn back time before your very eyes, and when we did, it made quite an impact. And, using the forest game field, we explored gameplay very representative of The Legend of Zelda that involved trees growing quickly one after the other and things disappearing or multiplying. That’s right. All sorts of ideas popped up, so we decided to make three separate areas. Could you explain what the transformation system is? Sure. The transformation system was the result of that experiment we did for gameplay with contrast in the desert. There is a cut through space and it turns into the past. Video: If you use your sword to strike a stone in the desert called a Timeshift Stone, the present turns into the past in a widening circle. If you use your sword to strike a stone in the desert called a Timeshift Stone, the present turns into the past in a widening circle. Oh, that was in the video we showed at Nintendo 3DS Conference 2011.4 I was impressed when I saw that transformation occur, spreading so quickly. 4Nintendo 3DS Conference 2011: A Nintendo 3DS presentation held in Japan on September 13, 2011. It felt good to our team that was making it, too. Placing Timeshift Stones here and there around the game field resulted in various types of gameplay, and it began to look as if we could include some challenging ones. You thought that if you made a slightly challenging stage to come after the forest and volcano, the players would be used to how to play the game and would enjoy it. That’s right. 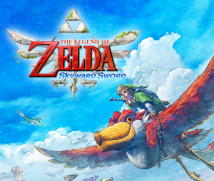 In our first session of “Iwata Asks” about The Legend of Zelda: Skyward Sword, we talked about the ancient civilisation. How rocket fists gave rise to an ancient civilisation. Yes. (laughs) The present time that Link is in is a desert region, but underneath all the quicksand lies an ancient civilisation. If you strike a Timeshift Stone with your sword, your surroundings transform back in time to reveal that ancient civilisation. I see. Kitagawa-san, you were in charge of the first desert area. What did you have in mind as you made it? It’s the first stage, so I paid a lot of attention to what changes would be easy or difficult for the players to understand. You prioritised helping the players understand the transformation system. Yes. If dried-out plants turned green again or cacti disappeared, that would be easy to understand visually, but turning that into material for gameplay would be too simple. It doesn’t make for a deep game experience. You can’t use it in the present, but when you return to the past, it works again. That’s right. By using that cart, you can go somewhere you couldn’t otherwise, and gameplay rapidly unfolded from there. The rocket fist item, which developed out of a boomerang and ended up as a beetle, led to the ancient civilisation, and then you added the transformation system, allowing you to think of a whole variety of gameplay experiences.